OK, so I presume* that this is the right forum for this question. But I don't really read comic books, and I have never had a Superman comic. I'm catching up on the Supergirl TV show, and just started the episode (the aptly named "Solitude") wherein Supergirl and Jimmy Olsen go to the Fortress of Solitude. Anyway, Superman keeps a key under the mat, but it's secure enough because it's made from "a million tons of condensed dwarf star." * - which makes a Pres out of you and me, so watch out, Trump. Couple of questions which I feel need addressing. But first of all, if it makes any difference, a little googling tells me that the comic All-Star Superman (and its animated movie adaptation) say "half a million tons". So there's that. OK, anyway, (1), and this could be a question in the science forum, or for What-If even, maybe... the weighs [half] a million tons and it's on ice? Which is over the Arctic ocean, right? Or is the Fortress supposed to be located in actual rocky mountains near (but not actually that close to) the North Pole, in I don't know, Alaska or the Yukon maybe (or potentially Greenland, or a smaller island, but probably not Siberia!) So... it would sink through ice, right? Would it sink through rock, too? like down to the mantle or something? (2) also kind of sciency, but is [half] a million tons way too big to make sense? I mean I know it's not like the mass of the moon, but would it still throw off the orbit of the earth or anything? (3) more of a comic-book question, but at least in the TV shows I have seen about Superman (Smallville, Superman The Animated Series / Justice League, Supergirl) other Kryptonians (and similarly super-powered aliens) are showing up ALL THE FREAKING TIME. And of course they're almost all enemies of the big guy. So really, how secure would this be? Or is it only the case that other Kryptonians show up in these TV shows because they need to create believable enemies for Superman/girl, because regular bank robbers (like in the old black-and-white show) are just too easily defeated? 1. I haven't a clue. It seems there are icebergs in that weight-range, but I imagine because the key is so dense it would actually break through any ice and sink to the ground (unless the ground is reinforced in some way). 2. No, it's a tiny fraction of the weight of the Earth, it wouldn't have any impact. 3. There have been cases where the Fortress of Solitude has been broken into (an episode of the Justice League comes to mind), but I don't know how often it actually happens. Interestingly, the Empire State Building apparently weighs about 300K tons, so if the keys weigh the same on Supergirl as they do in the comics, then lifting a building should be fairly easy for her. Then again, having inconsistent powers is fairly common in these types of stories. Since your question is also about the comics itself, I suppose it fits here. Otherwise, we also have a fictional science sub-forum. It's a tiny fraction of the mass of the Earth, alright, but it's also a tiny fraction of the radius of the Earth. This means the gravitational attraction at the key's surface would be [url=https://www.wolframalpha.com/input/?i=%28%281000000+tons%29%2F%285mm%29^2%29+%2F+%28%28mass+of+the+earth%29%2F%28radius+of+the+earth%29^2%29]a huge multiple[/url] of the 1g to which you're accustomed, even for a very chunky key. Expect local tidal effects if it reaches sea level. As for the ice, a chunky old key could possibly have a 10cm2 footprint on the ice. 907184740kg over 10cm2 is 9.072 * 1011 kg/m2, which at Earth's gravity is 8.89 * 1012 N/m2. The graph on this page shows the melting point depression effect of pressure on ice ... up to -21.985 °C at 209.9 MPa. 2.099 * 108 N/m2 isn't even the same order of magnitude as 8.89 * 1012 N/m2 ... obviously ... so that graph's precious little use in saying what'd happen if the ice couldn't get out of the way. Presumably, though, the key isn't appearing at rest on the ice. It's being lowered there, and would melt its way through the ice while still mostly supported by Superman's hand. At surface pressures, all you have to do to melt a solid is to heat it up to its melting point. It is true that the temperature rises as you go deeper and deeper into the Earth (15 - 20°C / km is the typical geothermal gradient). However, pressure is also rising as you descend into the Earth, and increased pressure inhibits melting. That means it shouldn't melt the rock. It should do some really interesting things to it, though. 13 GPa, aka 1.3 * 1010 N/m2, turns graphite in to diamond. At 683.8 times that much pressure ... er ... we don't know? At only about 7 times that diamond pressure, you get "Rock glasses (condensed from vapor)," which sounds absolutely awesome. Superman's Key is huge, in some versions bigger in size than Superman, so your numbers would be off. Sableagle wrote: It's a tiny fraction of the mass of the Earth, alright, but it's also a tiny fraction of the radius of the Earth. Local tidal effects? Not really, at 50cm distance it is already down to 0.02. I guess it could form a ball of material around itself. Edit: If it is bigger than superman then it's gravity won't do much. Zohar wrote: Superman's Key is huge, in some versions bigger in size than Superman, so your numbers would be off. 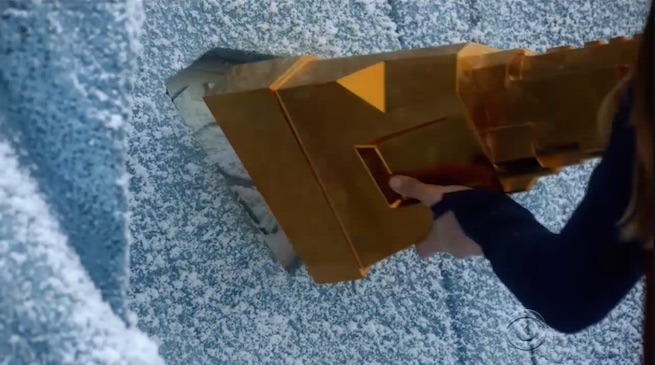 Actually, in both the episode of Supergirl and in the animated movie of All-Star Superman, the key looks like a normal-sized house key. Apparently he used to have a giant golden key* that also posed as one of those mid-century aircraft markers (and he claimed it was heavy enough that "it would take one hundred men to lift" it, so somewhere in the neighborhood of 5,000 to 10,000 pounds I guess), but he replaced it with the normal-sized but wacky-dense key weighing half a million tons. * nowhere near heavy enough to be actually solid gold, as a cubic meter of gold weighs slightly over 20 tons. It's not far off from Supergirl-sized. Anyway, like I already mentioned above, the expectation of anything to be consistent across 80 years of comic book history and dozens of writers (in addition to, like 15 TV shows, 10 movies, and 50 novels) is a bit unrealistic.